How to Password Protect Photo Albums on Windows? Have you ever worried about your personal photos on your computer being viewed by others when you leave your computer for a while in public or someone borrows your computer to use alone? Instead of just worrying about it, it’s better to take preventive measures. Trust me, every time you are in this kind of situations, what you strongly want is certainly to password protect your pictures on your Windows 10/8/7. Then how to password protect photos? Well, to save your worries, you can turn to Gihosoft File Encryption software which can protect your sensitive and important pictures from prying eyes by providing a complete data privacy and data encryption solution. 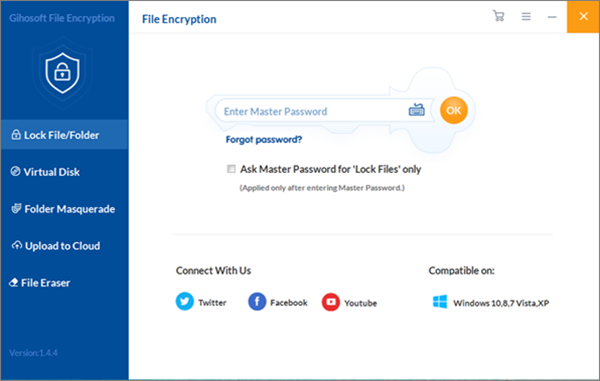 Welcome to download and try the trial version of Gihosoft File Encryption which can allow you to encrypt 3 files for free. If you feel good after having a try and want to enjoy the full benefits of this best software, you can buy it and then you can have access to its pro version. If you are a frequent customer who has already purchased this software earlier, then you just need to enter your registration details to upgrade it! Why Protect Images with Password? Well, you may wonder why we should password protect images. In fact, there are many reasons for us to encrypt images. Encrypted images play a key role in identifying the creator of an image, protecting copyright information, deterring piracy, and blocking images from being viewed by users who shouldn’t have access to them. With photos encrypted, you won’t worry about these photos being viewed by people whom you don’t want to see them when you send the photos through email or over the Internet. If you want to make sure the security of important photos on your home computer even when a hacker gains access to your hard drive, to encrypt your photos is worth a try! Likewise, locking the photos on your computer or laptop will make them safer if your device is lost or stolen. In order to password protect JPG, PNG, GIF, and other images, you first need to enter your master password after you run the Gihosoft File Encryption. Keep in mind that the master password is unrecoverable, so please make sure that it is easy for you to remember and difficult for others to crack. Only after you enter the master password will you have the right to use its functions. 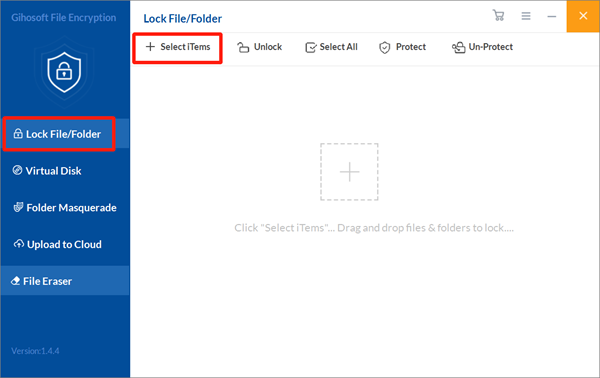 First click on Lock File/Folder option, then you can see Select Items and click on it. Then there will be a drop down box, and you can choose Add File or Add Folder to add pictures onto this page according to your needs. Alternatively, you can also click the symbol + in the blank space to add files/folders. Now the locked photos will disappear from its former location on computer and you will find the encrypted pictures listed on this software. If you need to check the photos in future, you can simply un-protect them by clicking the “Un-Protect” or “Unlock” icon in the software, then the items will re-appear in the same location on PC. Having looked through this whole article, I guess you must have answer to how to create password protected photo albums. And certainly, Gihosoft File Encryption is not only restricted to just protecting photos in its ability of serving protection, it can also password protect folders and files like videos, audios, recordings, notes, office documents, etc. Finally, don’t forget to download the trial version and have a try!